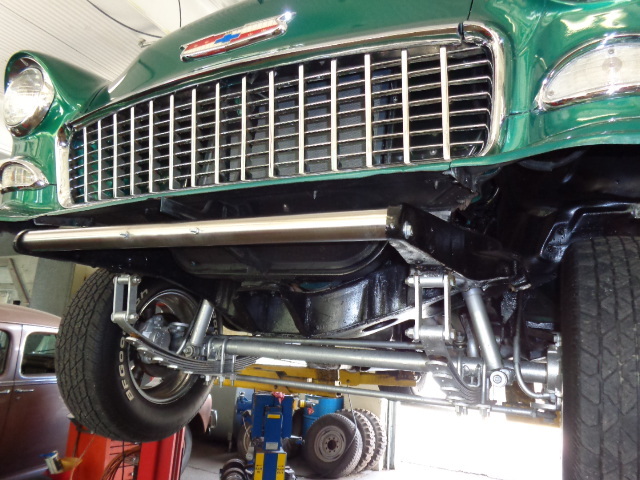 1955 Chevy gasser in to have exhaust fabricated. One wild and beautiful car. 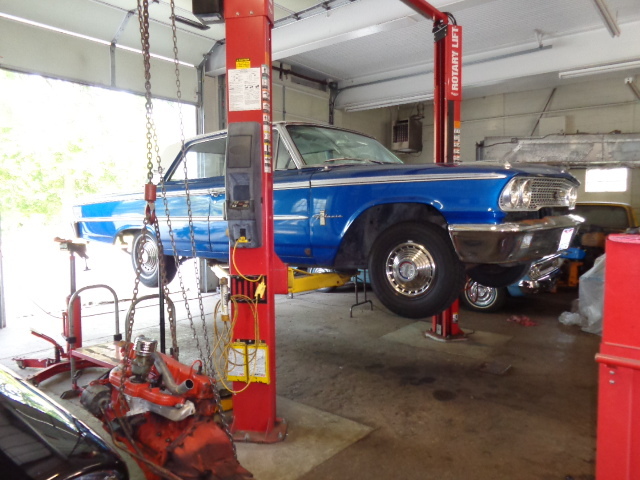 1963 Ford Galaxie at the shop. 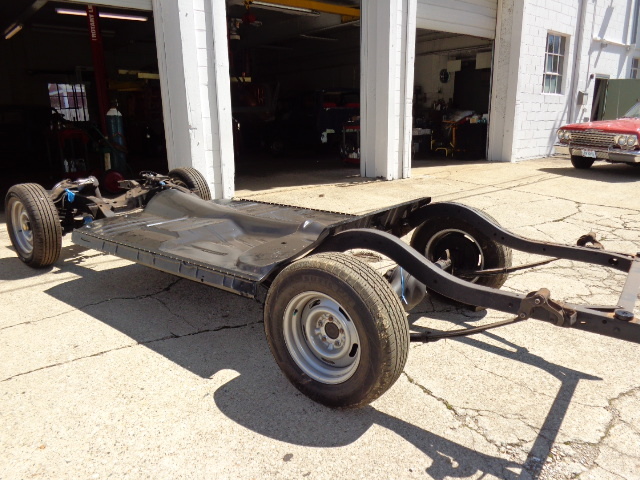 The new owner of this car wanted it inspected for safety and repairs made. 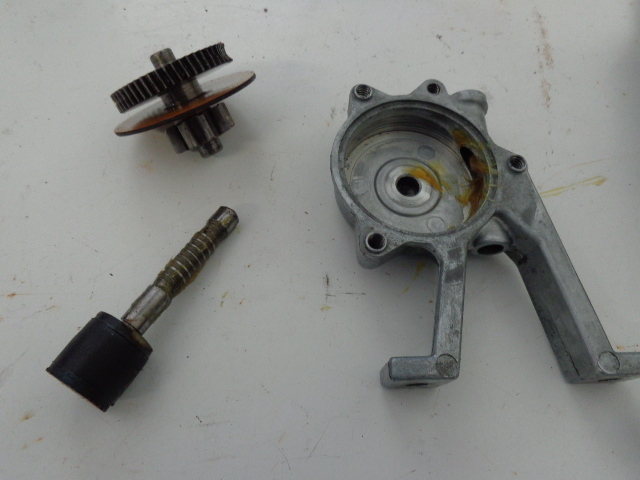 Power window gear box was taken apart, cleaned, lubed and assembled. This is the only way to make these windows work smooth. 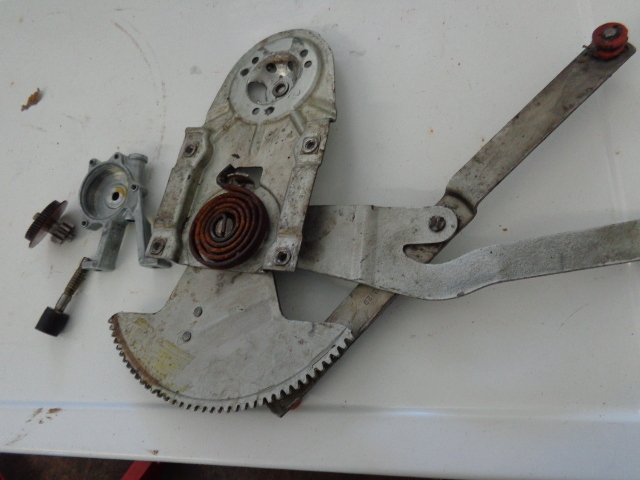 Complete power window assembly shown. 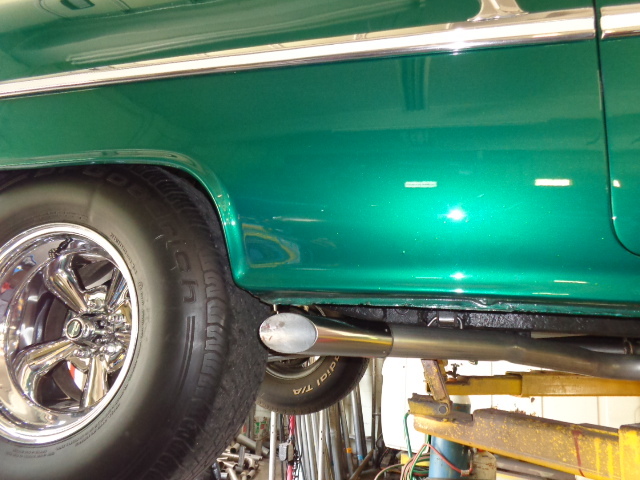 A rare option on the 63 Galaxie in those days. 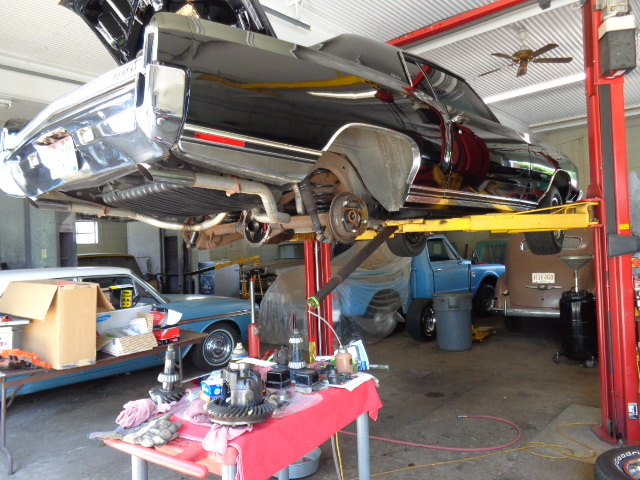 This beautiful black 1972 Chevrolet Monte Carlo is having a positraction unit and 355 gear added. 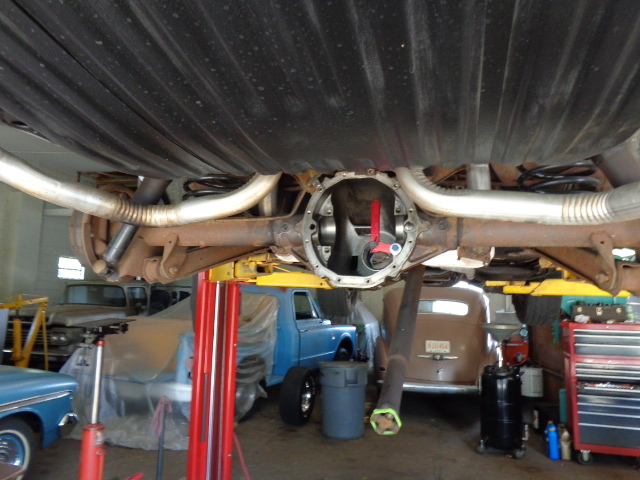 The speedometer will be calibrated for accurate speed. 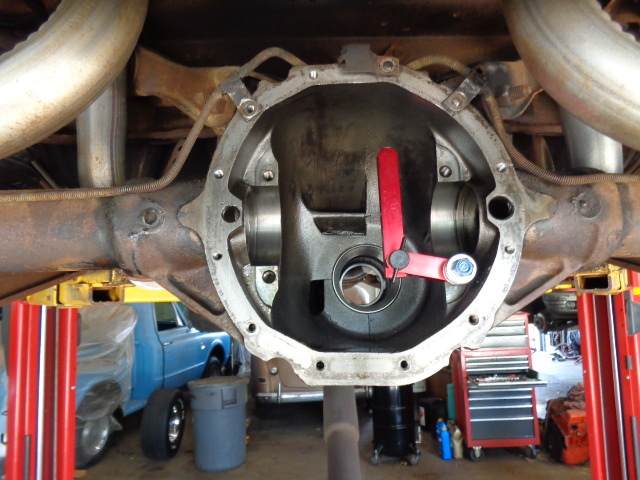 A 25 tooth speedo gear was installed to make things right. 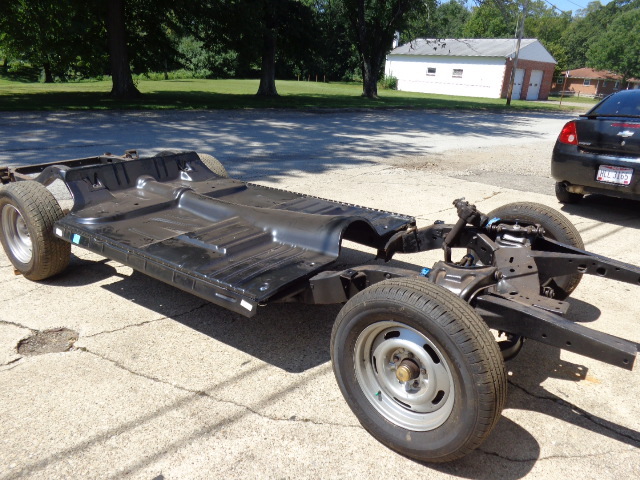 This is a 12 bolt Chevrolet rearend. The case was cleaned before installing the new gear set. 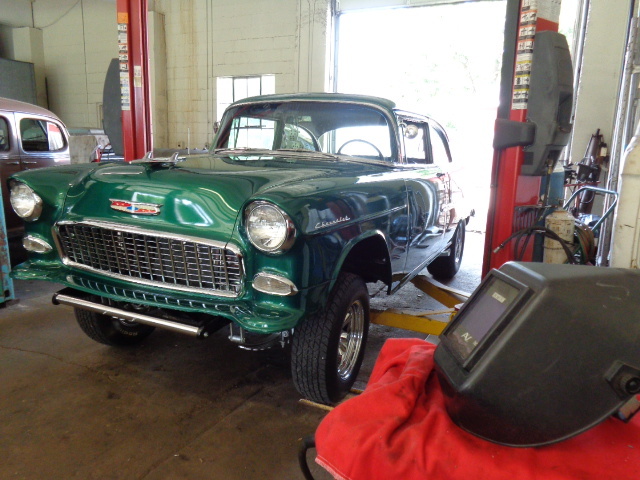 Very nice 1956 Chevrolet in for repair. 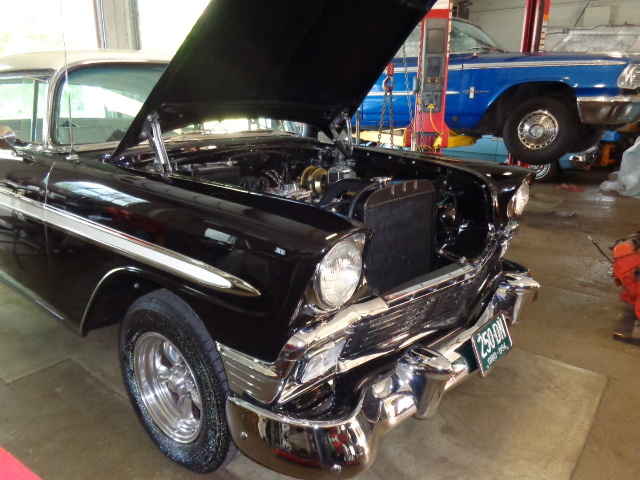 It has a 350 engine and 700R4 overdrive transmission. 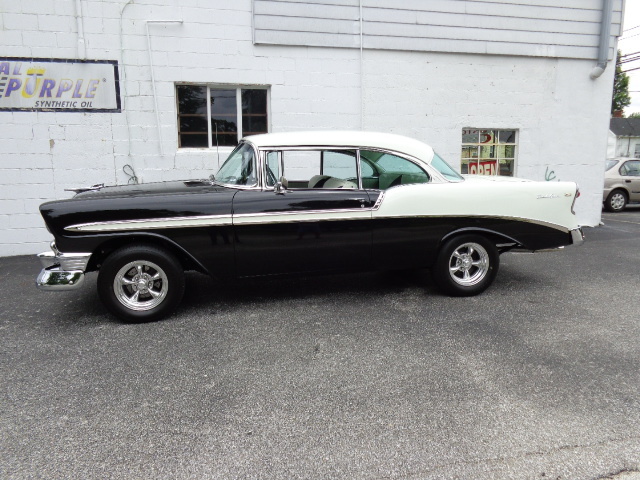 This 1956 is missing and causing the transmission to shutter or move in and out of overdrive at times. The problem was the spark plug wire ends were arcing in the distributor cap and causing heat and burning away the spark plug wire ends. This will cause a miss. Four bad ends were found. 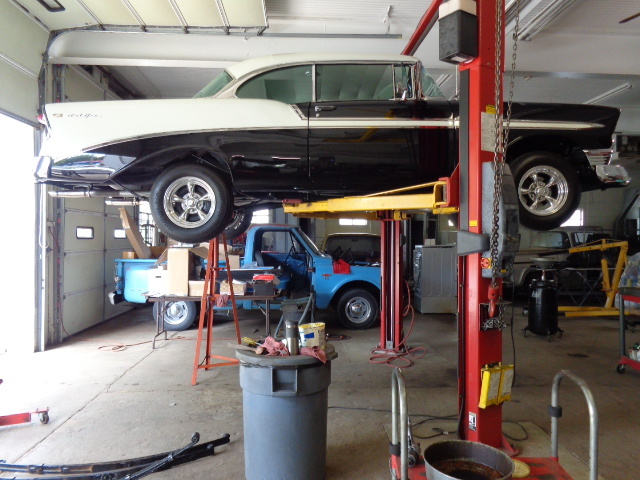 The distributor cap, rotor, spark plug wires, and spark plugs were replaced. It runs and shifts great now. 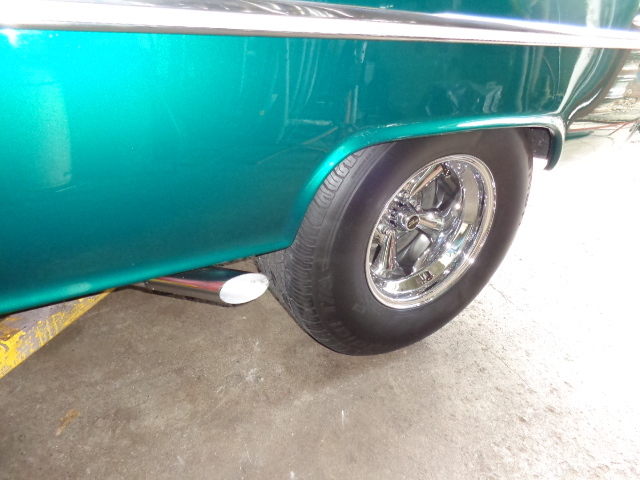 New rear leaf springs ( 5 leaf ) were also added to this ’56 Chevy to bring up the rear. 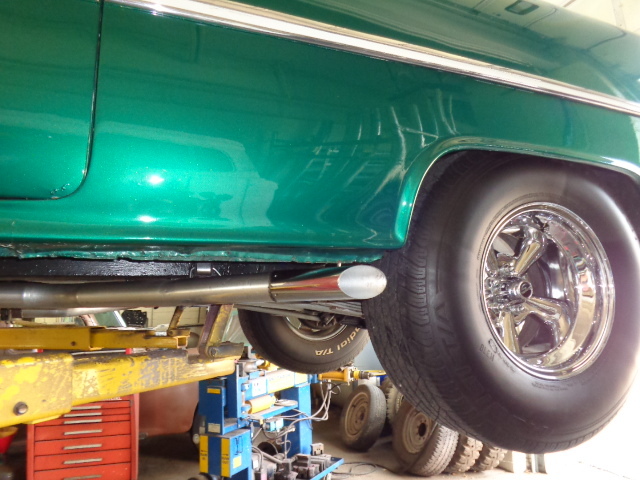 Now it has more of a level ride. The ride is much better. 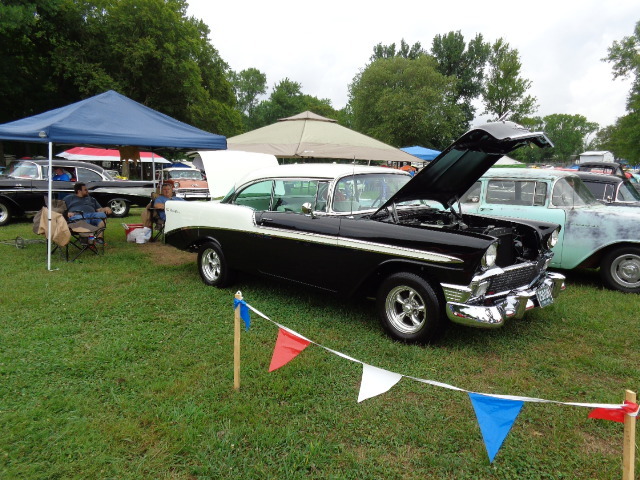 1956 Chevrolet at the Tri-Five National car show in Bowling Green, Ky. 1957 Chevrolet in our shop for new floor and both rockers. 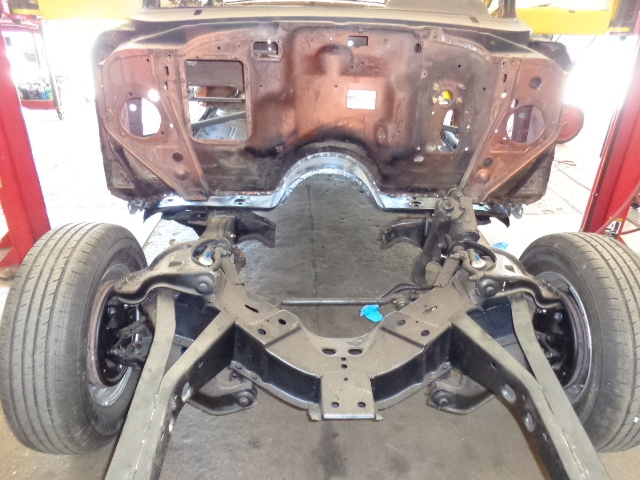 A small area of the trunk floor was also repaired. 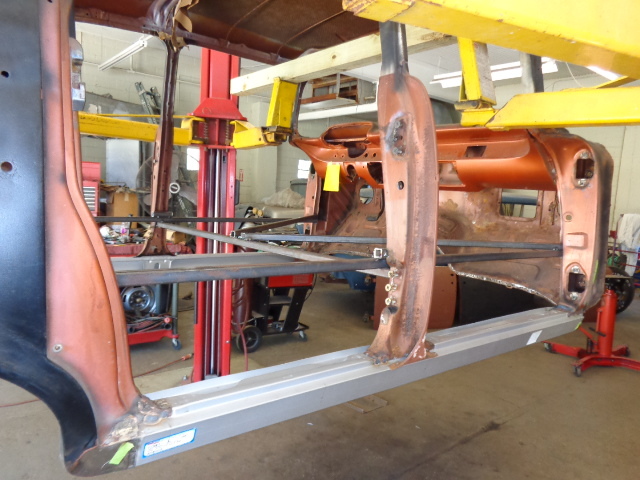 Bracing shown welded into place to help support and keep dimensions correct. 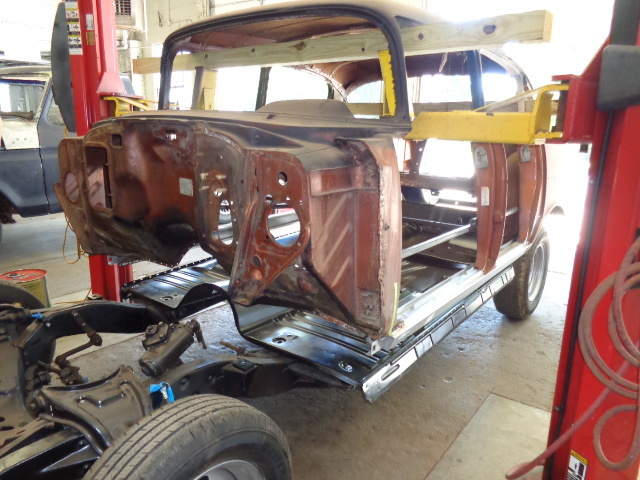 The one piece floor was bolted to the frame before the body was lowered into place. 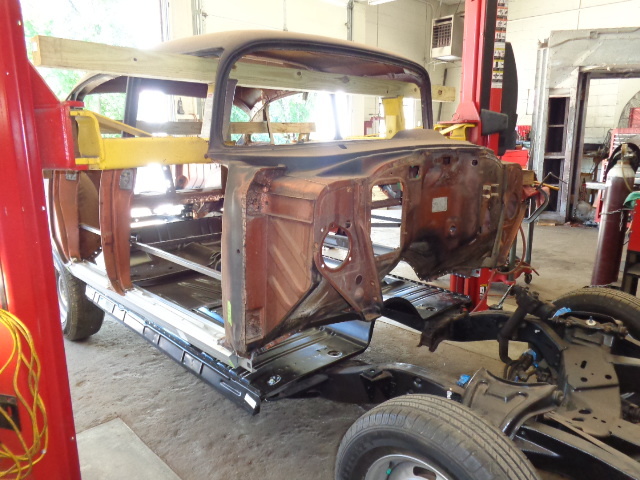 The 57 body is being lowered to the one piece floor. 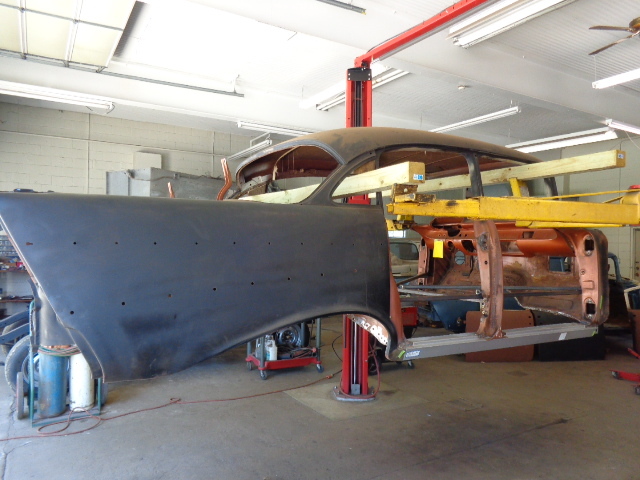 When all is in place, the spot welding will begin. All is good. 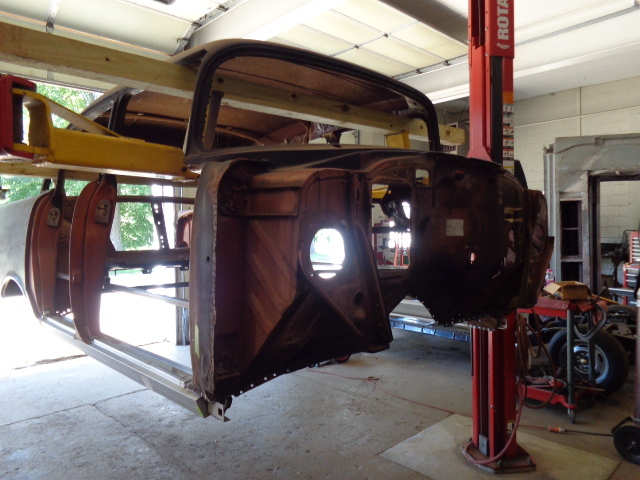 A rust free 1957 Chevy made like new again.